Pure electric vehicles are expected to become as cheap to own and operate as their petrol and diesel equivalents on a worldwide basis by as early as 2022, according to new research from Deloitte. The tipping point in the UK is forecast to come a year earlier in 2021, thanks in part to a £3,500 grant from the government for electric vehicle (EV) purchases. In the absence of this subsidy, the milestone would be set back by three years to 2024. The prediction is based on the annual ownership cost of a mid-sized car driven almost 8,000 miles each year. Taking into account the government grant, Deloitte pegs the current figure for the UK at roughly £5,500. 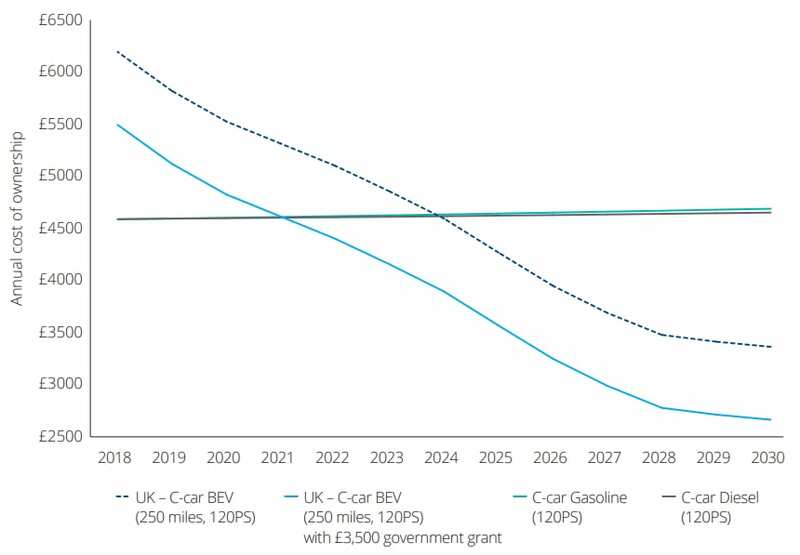 This cost is expected to fall to around £4,500 by 2021 – putting EVs on par with conventional cars – and drop below £3,000 before the end of the next decade. Michael Woodward, UK automotive partner at Deloitte, said: “In the UK, the cost of petrol and diesel vehicle ownership will converge with electric over the next five years. Source: New Market, New Entrants, New Challenges, Deloitte. Figures from the Department for Transport, Auto Trader, Go Compare, RAC and Kwik Fit. Note: The cost of ownership is a five-year average for a C-segment car travelling 7,900 miles annually.